A recent Bankrate survey indicated that Millennials love sitting on piles of cash and are spooked silly of the stock market. And one can see where they’re coming from. As a Millennial myself, I remember graduating college in 2009 when the stock market was in the toilet. I recall the perfect recipe of career anxiety, terrifying financial headlines, and the fear of losing what little they had causing many of my peers to avoid stocks like the plague and opt to hoard cash instead. But how sound is that strategy really? Should you really never invest in the stock market? 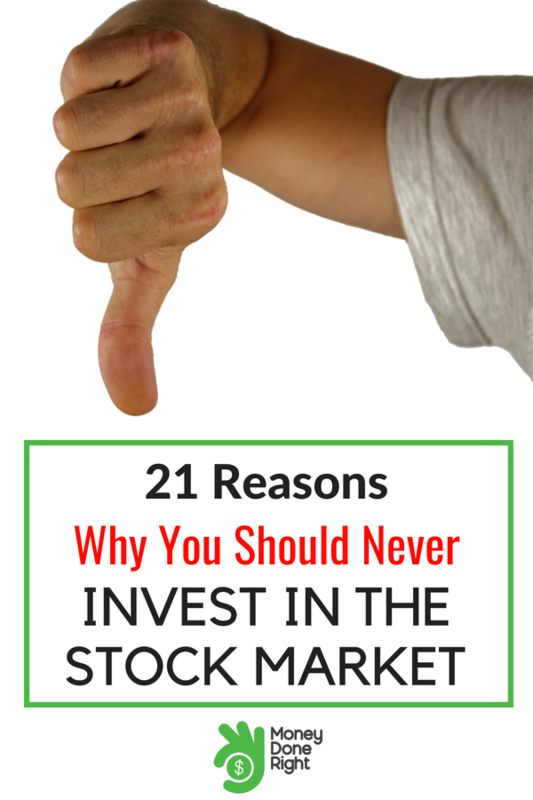 Should You Never Invest in the Stock Market? The world — especially the financial world — is a scary place sometimes. In this article I’ve listed 21 historical events from the past 20 years that, at the time, may have looked like pretty good reasons to not invest in the stock market. Examples include 9/11, the collapse of Lehman Brothers, and Brexit. That’s scary stuff right there. And then I show you how much the stock market has been up since then…and it’s typically double- if not triple-digit growth. So yes, the title of this article is a little clickbaity. But the reality is that it’s no more clickbaity than what the financial media is constantly doing when it comes to financial news. See, the financial media specializes in promoting scary headlines to get you to click and be freaked out about your financial situation. As a blogger myself, I know that the scarier a headline is, the more likely it is to get clicks (and therefore advertising revenue). Some investment hucksters even use the fear induced by the media to take advantage of people and trick them into purchasing incredibly expensive investment products promising “guaranteed” returns. Or others, probably more well-meaning, convince people to sell everything and put it all in precious metals. But the truth is that you definitely should invest in the stock market, as historically it generates good returns in the long run. You just have to make sure that your asset allocation is appropriate for your age and risk tolerance. If you’re 22 and fresh out of college, your allocation may justifiably be heavily skewed toward stocks and perhaps alternative assets because you have decades to recover if the stock market dips for a few years before rising again. But if you’re 62 and planning to retire in the next few years, you really can’t afford to be all-in with stocks because there’s always a possibility that — just your luck! — the stock market will tank just as you are planning to retire. You need to be aware that there will always be downturns in the market, and it is impossible to know when they will be. It is hard to put an exact date on market declines, as sometimes a recession is ongoing with a number of causative origins. However, it must be understood that despite stock market declines, the market does tend to go up with time. So despite all crashes, if money is left in the market, it is going to compound and grow steadily. This is one of the easiest and most obvious ways to get wealthy and a fact well known by wealthy individuals. The main index used for the purposes of comparison is the S&P 500, a list of the largest 500 publicly-traded companies in the United States by total market capitalization. Other indices include the Dow Jones Industrial Average (DJIA), a list of 30 large public companies that are not weighted, and the Nasdaq Composite Index, a list of 3,300 weighted companies traded on the Nasdaq stock exchange. In this article, I list 21 “scary” financial events leading to stock market declines, their specific effects on the S&P 500, and how the S&P 500 has performed since these events occurred. Click here to check out top stock investing company Betterment. Betterment provides personalized advice based on your situation with a transparent, easy-to-understand fee structure. Below is a list of market declines that took place since 1997. If you are looking to invest in the stock market, you are certainly going to encounter some rough patches regardless of your trading platform or individual level of expertise. But as the list below shows, you can also count on the stock market rising again after these rough patches. It may not happen as soon as you like, but historically, it has always happened. What happened: Investors started to desert Asian emerging stocks, with crashes in multiple Asian countries. It peaked in a global stock market crash in October 27, 1997. The Dow started dropping on October 14. By the 19th, the S&P 500 had lost 20%. On October 27th, the S&P 500 fell 6.86% to 877. Both the Dow and the Nasdaq Composite fell 7%. Since then: S&P 500 is up 221% to 2820.40. What happened: In 1998, the Russian government devalued the ruble and defaulted on its domestic debt. Foreign investors abandoned the market completely. August 31st saw a complete market meltdown. The Dow sank 6.4%, the Nasdaq Composite lost 8.6%, and the S&P lost 6.8% to finish at 957. The inability of the Russian government to create a cohesive set of policies was what led to the loss of investor confidence. Since then: S&P 500 is up 194% to 2820.40. What happened: After an abandonment of Nasdaq tech stocks, both the Dow Jones and the S&P 500 took a beating. The S&P 500 fell 2.2% on the day to 1289. Tech stocks had formed the backbone of the market until then. However, 1999 was actually a good year for both the Dow and the S&P 500. Since then: The S&P 500 is up 118% to 2820.40. What happened: On March 10th, the Nasdaq Composite peaked, being largely composed of internet based companies. Many shut down completely, and Cisco saw an 86% loss. The year 2000 saw a series of events that were extremely negative to the internet industry and prices fell continually. The S&P 500 ended the month at 1461. Since then: The S&P 500 is up 93% to 2820.40. What happened: After planes hit the world trade center and north tower in the USA, it triggered a huge market collapse. The attacks themselves cost an estimated $40 billion in insurance losses, among the biggest insured events ever. Many trading exchanges shut down due to the loss. The S&P lost over 11.5% by Friday. On the first day of trading after 9/11, the market was down 7.1%. The S&P 500 ended the month at 1076. Since then: The S&P 500 is up 162% to 2820.40. What happened: Starting in March 2002, indices started to slide heavily and consistently for months. Many companies went bankrupt or underwent a step decline. After a rally from the 9/11 decline, the S&P was down 27% by late July. Stock markets across the USA, Canada, Asia, and Europe were hit. The S&P 500 ended July at 912. The 2002 stock market downturn is often viewed as an extension of a larger bear market correction that began in 2000. An outbreak of scandals, such as Enron, hastened the downturn. Since then: S&P 500 is up 209% to 2820.40. What happened: Iraq war fears devastated the stock market in March 2004. After news of a prolonged Iraq war hit the media, investors exited the stock market in droves. The S&P 500 lost 3.5% in single day, with the Dow Jones losing 3.6% and the Nasdaq Composite also losing 3.6%. The selloff followed one of the largest stock rallies seen in years. The S&P 500 finished the month at 890. Since then: S&P 500 is up 216% to 2820.40. What happened: The markets tumbled after an assassination of the head of a US appointed governing council in Iraq. Sell-offs started in Asia, then spread to Europe and Wall Street. The Dow Jones lost 1.1%, while the S&P 500 lost 1%. Rising interest rates along with high oil prices had sent stocks on a downward spiral. The S&P 500 finished the month at 1132. What happened: On June 23rd, 2005, the S&P lost 1.1% and the Dow Jones lost 1.6%. The fall was attributed to investor fears, worrying that oil near $60 a barrel would hurt growth. The Nasdaq Composite lost about 1%. April also saw a sell-off after a low IBM earnings report and poor economic data. The S&P 500 finished the month at 1222. Since then: The S&P 500 is up 130% to 2820.40. What happened: Both the Dow Jones and the S&P 500 lost 1.8% after Ben Bernanke of the Federal Reserve cited economic fears regarding inflation and slow growth. However, both the S&P 500 and the Dow Jones were having strong years of growth during the period of Fed created decline. The S&P 500 sank to 1263. Since then: S&P500 is up 123% to 2820.40. What happened: The crisis of 2007 started in the US housing market. Banks repackaged risky mortgages with good ones in a fraudulent operation which brought the world to its knees. In August 2007, the Federal Reserve recognized that banks did not have enough liquidity to operate. By November, a Superfund was created to absorb toxic debt. The housing crisis and the 2008 global recession are intricately linked. On August 9th the S&P 500 sank 3% to 1453. Since then: S&P 500 is up 94% to 2820.40. What happened: The collapse in the subprime mortgage market in 2008 led to a worldwide banking crisis. Excessive risk taking by banks exacerbated the problem. It is widely held to be the worst crash since the Great Depression of the 1930’s. During September 2008, the Dow Jones fell 777 points. On the 22nd of September, the S&P 500 closed at 1207. The reason for the drop was that US congress rejected the bank bailout bill. When Lehman Brothers filed for bankruptcy in September, the economy tanked, sparking a world wide recession. Since then: The S&P 500 is up 133% to 2820.40. What happened: October 2007 to March 2009 is generally the timeline given for the great financial crisis. Stocks hit an all-time low on March 9th 2009, with the S&P 500 finishing down 1% on that day to 679, the lowest it had been since September 1996. The Dow lost 1.2%, its lowest point since April 1997. Investors confidence was at all time lows, but it was the end of the storm that started in 2007. Since then: S&P 500 is up 315% to 2820.40. What happened: On May 6th, a flash crash wiped billions off some of the world’s biggest companies. Markets around the globe fell, in France, the UK, Germany, and the USA. 2 traders flooded the market by placing large sell orders, and were later charged. The S&P dropped 3.24%. for the day, down to 1127. Most markets regained the losses quickly. Since then: S&P 500 is up 150% to 2820.40. 2011 was the first of a long running Greek debt crisis. A massive debt default sparked panic in the country. The markets recovered somewhat when the International Monetary Fund and European Institutions gave a bailout. The S&P 500 dropped a whopping 6.66% to finish at 1120. The debt crisis worsened in September and continued until 2012. Since then: The S&P 500 is up 152% to 2820.40. Due to Eurozone fears, primarily related to the ability of Spain and Greece to repay their debts, the S&P 500 would decline 6% in May. The Nasdaq dropped 7%, and the Dow would only have 5 positive days. The S&P 500 booked its worst monthly loss since September 2011 and ended at 1313 on May 31st. By the end of 2012, a total of seventeen countries were seeking help from other nations. Portugal, Ireland, Italy, Greece and Spain were hit particularly hard. Since then: S&P 500 is up 115%. to 2824.40. What happened: Federal Reserve chairman Ben Bernanke raised fears by announcing that stimulus policies may be winding down. In response, the Dow finished down 2.3% and the S&P sank 2.5%, marking its biggest drop since November 2011 and ending at 1584.32. The Nasdaq dropped 2.3%. Bernanke offered more clarity and detail about tapering bond buying than the market had predicted, making it seem a certainty. Since then: The S&P 500 is up 78% to 2820.40. What happened: Declining oil prices led to a decrease in the S&P 500 in late 2014. The S&P fell 1.6% on the day and ended up down 3.5% for the week at 2005. It was the worse weekly hit since May 2012. The Dow finished down 3.8%. The CBOE volatility index rose in response. The International Energy Agency then reduced its outlook for global demand, compounding the problem. Since then: S&P 500 is up 41% to 2820.40. What happened: The S&P 500 fell 2.1% after news of the failure of Greece to meet its 2011 loan repayments swept the markets. It was the largest one day decline since April 2014, finishing at 2098 on the 29th of June. The Dow Jones fell 350 points. Markets around the world fell, except for gold, the contrarian investment. The CBOE Volatility Index (Fear Gauge) rose 37%, the highest it had been since February 2015. What Happened: Brexit was a surprise decision of Great Britain to leave the European Union. The details of the departure have not yet been finalized. The Dow Jones fell 3.4% and the S&P 500 fell 2.9% to 2,058. The final date for Brexit to leave the EU is the 29th of March, two years after the election date. What Happened: The S&P 500 slid 2.4% over the 28th and 29th of February 2017, closing at 2380.83. This was the largest retreat since January 2016. The reason for the pullback was over Federal Reserve Policy fears, which increased the CBOE Volatility index to 30. It is practically impossible to time when market declines are going to occur, and even the best can lose in a volatile game. This is because the stock market often behaves irrationally. Many news headlines that could be expected to crash the market can have no impact whatsoever. And other days, the stock market can undergo a crash with no apparent reason. While market analysts may point to multiple causes for why the market acts the way it does, it is always hard to say for certain. It should be borne in mind that despite all the setbacks, the stock markets always go up over time, as can be seen by how much the S&P 500 has consistently risen year on year. The overall trend is upward. So time in the market always beats timing the market, which is impossible to do. However, there are a number of tricks and techniques that you can use in order to optimize financial trading. Traditionally, the barriers of entry to the investing marketplace were quite high. A lack of technology, a slower moving world, and strict regulation meant that it was nearly impossible for regular investors to gain any type of access. Thankfully, this is now changing with a wide variety of applications which can assist investors to not only gain access to the market, but also provide a comprehensive set of analytical tools and research materials. What was not long ago the domain of traders in financial institutions can now be made available to investors from their smartphones. Choosing the right application can often be the difference between a profitable trading venture or a losing one. If you are new to the stock market, then you could always choose a robo-advisor. They have a list of prebuilt portfolios consisting of a number of stocks across various sectors. Your risk is minimized with the diversification, and fees are often minimal. Click here to check out top robo-advisor Betterment. Betterment provides personalized advice based on your situation with a transparent, easy-to-understand fee structure. Betterment is the largest independent robo-advisor. It has over 300,000 clients and over $11,000,000,000 in assets under management. There is no minimum investment with Betterment and its fees are 0.25% a year, much lower than most financial outlets. With its goals-based investment strategy, Betterment helps people understand how their investment portfolio fits into their life. And with no minimum balances (unless other firms that may require a minimum of $1,000 or more), Betterment is accessible to everyone. I do believe that every business comes with advantages and disadvantages. In fact, all we do in most cases is take a calculated risk before diving into any investment. We never can tell, alas sometime does fall short. But, the irony is that no risk, no business..
One more reason that is the main reason is that those who make the laws did allow a conflict of interests by allowing factory makers to put their company pubblic into the stock market while the same company was selling their product that in turn was treated as a mandatory to purchase by law. Example: Cash registers, etcetera. It’s a conflict of interests that is meant to do economic wars. This criminal way of handling the law turned the dutch people into an american station of fake dutch government operating from the USA and making pressure to make new mandatory laws. The 9/11 disaster could be the result of an economic wars between criminals involved into the stock market and either the law making process (dutch-american) or the anti-law making process (muslim).